We don’t mezze around… Dice and blend Fry’s meat-free Polony in a food processor with plant-based mayo, herbs and spices and you have yourself a tuna-style pate. This makes a great holiday or festive starter dish. This is SATAY-sfaction! Throw a peanut butter satay sauce over of Chicken-Style Strips from Fry’s and airfry, grill or bake then for a party starter sensation. An abundant heart-healthy fresh veggie platter featuring fresh, raw vegetables and Fry’s Prawn-Style Pieces, with a light, heart-healthy tzatziki. It is perfect for sharing with friends and family. 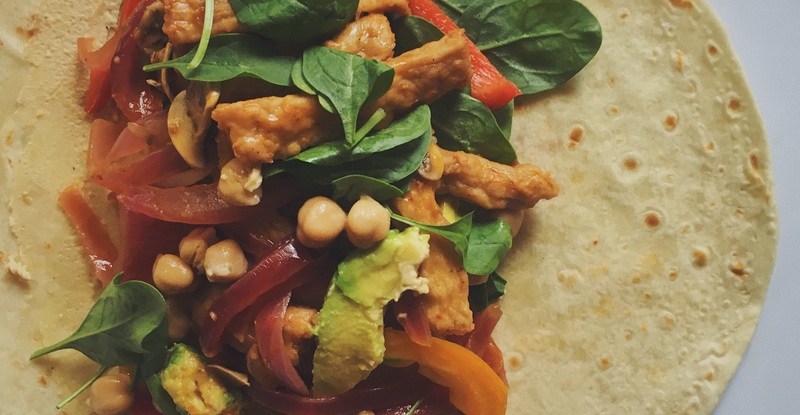 Get loaded on veggies and enjoy this easy meat-free, chicken-style lunch wrap, created by Francesca Eats Roses, one our MFM supporters. Meat-Free Mondays is an environmental campaign raising awareness about the negative effects animal agriculture has on our environment, human health and the animals. Are you a Brazen Banter or a Vivacious Vegan? Healthy and Plant-Based on a Budget!